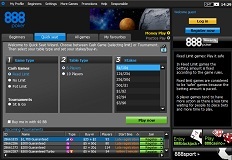 888 Poker is a site located on the 888.com gaming network that provides poker players with a place to play their favourite poker variations including Hold'em, Omaha and 7-card Stud. 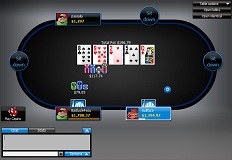 888 Poker's software is available free and in both a download for PC users and a flash version for Mac owners. This means that all players, regardless of the computer they operate, can take advantage of 888 Poker's promotions including deposit bonus, an abundance of freerolls and a rewarding VIP program. Join 888 Poker here and earn up to $600 bonus! Deposit $100 and Receve $100 Bonus + $8 Cash - Max Offer 100 to $600 / €400 / £400 - No Bonus Code Needed! The welcome bonus promo at 888 Poker is one of the most generous online. You do not need a bonus code to receive your bonus at 888 Poker. Simply signup here and you will receive a 100% match on their first deposit up to $600 / €400 / £400. On top of your $600 deposit bonus, you will also receive a complimentary credit of $8 on the house. The instant cash bonus is applied to your account once you've confirmed your email address after registration. Players will need to earn 100 points for every $10 in bonus dollars.For every 10-bonus points that are earned, $1 of the bonus will then be cleared. Players will earn 2 bonus points (plus 2 status points) for every $1 in fees that are paid and the same for every $1 contributed in rake. Poker players can also earn their bonus by playing in the casino and will earn points at the rate of 1 bonus point per $16 wagered. However they choose to clear the bonus, players will only have 90 days to do so. In addition to the bonus, all first time depositors will also receive $4,500 in freerolls. There are 7 different $500 freerolls and one $1,000 freeroll, all of which can be entered free. Finally, 888 Poker is offering a weekly $50k First Depositors’ Challenge. All new depositing players will earn their seat into the qualifier, and the top 20 players in that event, win entry into the weekly $50K freeroll. Bonuses are subject to terms & conditions! The VIP program at 888 Poker is rather neat because it rewards players on their month-to-month activities as well as their activities for the year. The 5 monthly statuses consist of blue, bronze, silver, gold and platinum while VIP and VIP Diamond make up the yearly VIP statuses. Players move up in status by earning "status points" which are earned by real money play at roughly the same rate as bonus points. Each month, players will be given "reward points" based on their current monthly status. This is on a sliding scale which means the higher a player's status, the more reward points he or she is given per 1 status point. For example, if you were a bronze status member, you would receive 1 reward point per every 1-status point. However, a silver member would actually receive 2 reward points for every 1-status point. Reward points are used to exchange for cash. At this time, 888 Poker does not have a gift store up and running, but when they do, reward points will be used there as well. Receive a huge 100% deposit bonus up to $600 / €400 / £400 when you join 888Poker from this site. Easy to clear, with only 100 points needed for every $10 in bonus dollars.